16" M4 profile barrel is chrome lined in both bore and chamber. Birdcage Suppressor. Receiver length Picatinny optics rail featuring two 1/2" optics riser blocks. Features heavy oval M4 type handguards. Six position telestock reduces overall length by 4" when fully collapsed. 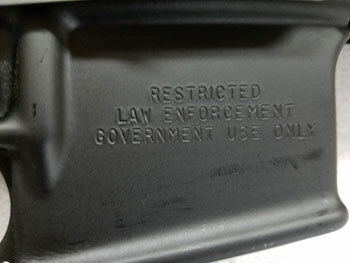 The magwell on this rifle is stamped "RESTRICTED LAW ENFORCEMENT GOVERMENT USE ONLY". It is available for sale now to the public.